Yoga in Copley Square is back again this summer. If you recall last year, it was a one day event (here). This year it's back once a week for the entire month of July. 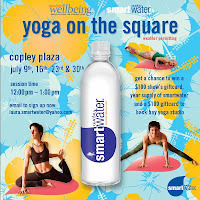 glacéau smartwater is hosting four complimentary yoga classes on copley square in the month of july. so head on over wednesday july 9th, 16th, 23rdand 30th classes are from 12pm-1pm weather permitting. be sure to get out your best pair of stretch pants, inhale, exhale and come showoff your downward dog! everyone will have a chance to win a year supply of smartwater a $100 gift card to Back Bay Yoga Studio and $100 gift card to Shaw’s! so come take a break, don't fight it, get into your warrior one stance and get a kick in the pants with electrolyte enhanced smartwater. email to sign up now: laura.smartwater@yahoo.com. I haven't done any yoga since trying it out last winter. I've been sticking with the running. It's done me quite well, except the July 4th weekend really did me in. I need to get back on the treadmill and stop eating carbs at night. 0 Response to "Yoga In Copley Square on Wednesdays - 7/9"